Crestview’s Brant Richardson leaps for a throw as Ottoville’s Brice Schroeder heads to first base during Saturday’s game at Ottoville High School. 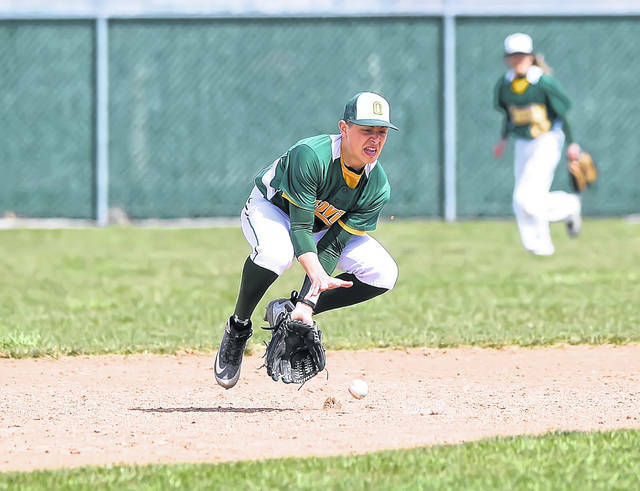 Ottoville’s Carter Schnipke fields a ground ball during Saturday’s home game against Crestview. 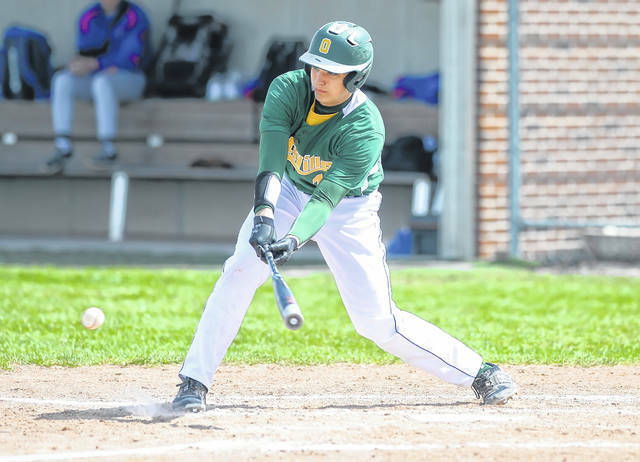 Josh Thorbahn bats for Ottoville during Saturday’s home game against Crestview. 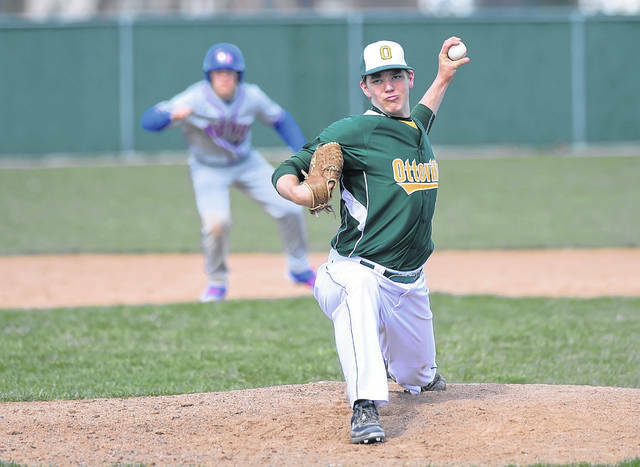 Josh Thorbahn pitches for Ottoville during Saturday’s home game against Crestview. 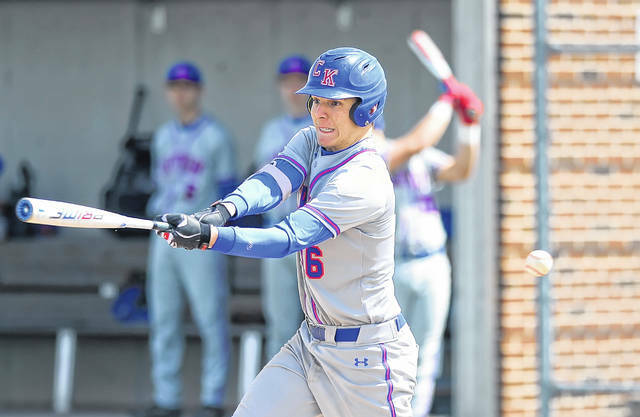 Brant Richardson bats for Crestview during Saturday’s game at Ottoville High School. 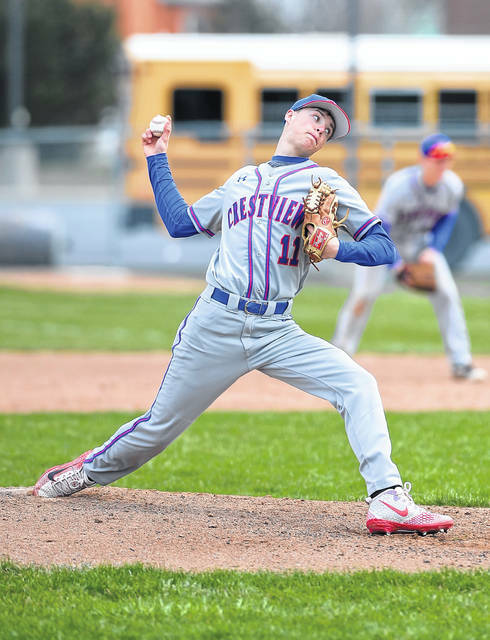 Griffin Painter pitches for Crestview during Saturday’s game at Ottoville High School. 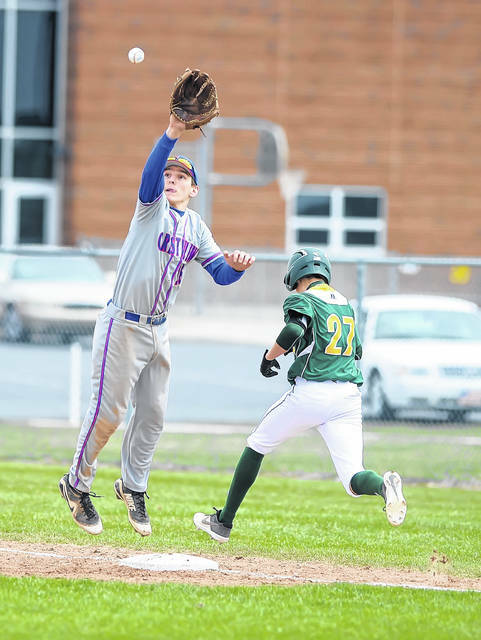 OTTOVILLE — Ottoville head baseball coach Ty Wannemacher has been waiting for that all-around performance from his young squad. So far this season, Wannemacher’s team has struggled in several different areas. However, the Big Green put it all together Saturday afternoon, en route to a 10-4 nonconference victory over visiting Crestview. At the plate, Ottoville (3-5) pounded 10 hits off Crestview pitching. On the mound, Wannemacher got a solid pitching performance out of sophomore Trae Schlagbaum, who came in to relieve starting pitcher Dylan Kemper, early in the first inning. Schlagbaum took over pitching duties in the first frame and worked 4 2/3 innings before giving way to Josh Thorbahn in the sixth. Thorbahn closed the game out for the Big Green. Schlagbaum did not give up a run, while scattering just two hits. Schlagbaum struck out seven, walked two and hit two batters. He threw 91 pitches. Kemper was tabbed for two runs on one hit, while walking four batters in his short-lived appearance on the mound. However, Kemper did redeem himself at the plate. In the home half of the fourth, Kemper drove a pitch from Crestview starting pitcher Griffin Painter, over the left field fence for a three-run home run, that gave the Big Green a 6-2 lead. Crestview (3-7) managed to cut the deficit to 6-4 in the sixth. However, Ottoville scored four runs on four hits in the bottom of the sixth to pull away. “It was huge for us to get out of that first inning,” Wannemacher said. “For Trae (Schlagbaum) to come in and throw well in that first inning was huge for us; and he just continued to do that the rest of the game. “We wanted to pull him (Schlagbaum) after about 60 pitches, but he was pitching too well and we needed to win this game. So, we said, ‘He’s going to keep going.’ So, him coming in and shutting them down was huge for us. Then our bats came around too. That was big. We had some opportune hitting; and we haven’t had that all year. We’ve left guys on base in scoring position. … That’s been killing us all year. Schlagbaum not only got it done on the mound, but he did damage at the plate. For the game, Schlagbaum was 3 for 4 with two doubles. He also scored three runs. Jack Langhals (2 for 3, RBI) also had a multiple-hit performance for Ottoville on Saturday. Thorbahn, who moved over from his first-base position to pitch for the Big Green, was 1 for 3 with two RBI. Both runs driven in by Thorbahn came in the big sixth inning. Riley Saylor led Crestview at the plate, going 2 for 5. Longtime Crestview head coach Jim Wharton said his young team is going through some growing pains. “Our pitching has been pretty good,” Wharton said. “We didn’t throw Griff (Griffin Painter) at all this week, because he threw twice last week. So, he was a little bit rusty. He went 3 2/3 innings with 10 strikeouts. But giving up six runs makes for a rough day. “We’re an inexperienced team. We’re learning how to compete. We left 13 base runners on today. That’s been the Achilles heel, along with having some miscues and kicking the ball around a little bit in the field. Today, we didn’t kick it around all that much, but we didn’t quite get the pitching performances and we certainly didn’t get the quality at bats. … We didn’t hit while having runners in scoring position. Ottoville is a young team; and they just kept fighting. … They just kept playing,” Wharton said. This entry was tagged crestview, ottoville. Bookmark the permalink.